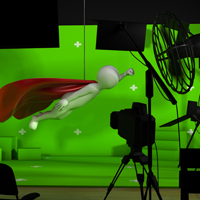 motion graphics and more – during post-production. Exceptional consistency: no variations in lighting, set decoration and other factors. Excellent set control: no chance that the janitor wanders through at the wrong moment. It’s simple to revisit projects in the future – if you change your logo, for instance. Go green: it’s great for video, too. Call Perlow Productions at 856-669-1669.